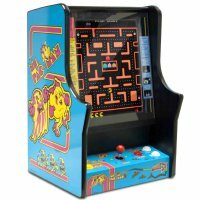 Equip your recreation area with the classic Ms. Pacman and Galaga home arcade bartop game machine and enjoy its space saving and portable design. The licensed counter top version of the full-size arcade game features the same vibrant cabinet graphics and the same classic arcade style controls. These ensure full-size fun from a countertop-size game machine! In addition, this gameroom machine features a no coin-op design. Great for your home, game room, man cave, or bar, this stunning arcade machine will keep everyone entertained for hours on end. Built with the same arcade-tested electronics as the full size models, and familiar classic graphics, images, and sounds of the original games, this compact replica is a must have for every rec-room.